As you may know, there are several types of nootropics. Not all of these types work in the same way. It is beneficial to know how each type of nootropic works before building a stack. This will allow for one to experience maximum efficiency in their regimin. Below we will review some of the most common types of nootropics available today. You may hear the term “cholinergic” coined quite frequently on this site and others. This is because cholinergic nootropics are the most common types available today. Cholinergic typically refers to the neurotransmitter acetylcholine. Acetylcholine is vastly important in muscular movement and cognitive function. Malfunction of acetylcholine and the cholinergic system has long been related to cognitive and neurological disorders. Acetylcholine dominates the parasympathetic nervous system. The neurotransmitter controls most of our “automatic” actives as well as muscle movements and heart rate. 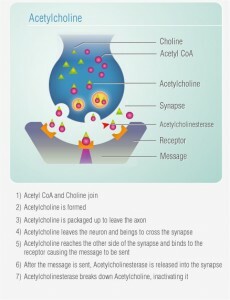 Acetylcholine and the cholinergic system also have a large influence on cognitive function such as learning and memory. Cholinergics refer to a large range of nootropics as this term simply refers to any substance affecting the acetylcholine system. Several types of brain supplements interact with the system in a different manner. Below are the different types of cholinergics. Positive allosteric modulators are substances that enhance the signal at a receptor. The racetam group (piracetam, aniracetam, etc…) are positive allosteric modulators of the acetylcholine receptor. This is a main method of action of most types of racetams. Racetams are not considered their own type of nootropic because they have other methods of action but primarily their effects are believed to be on the cholinergic system. Acetylcholine precursors are also considered to be types of cholinergics. This is because they directly or indirectly increase the amount of acetylcholine in the brain. Choline is the most common type of choline precursor however there are also other compounds that act as intermediates in the production of acetylcholine (citicoline). Other cholinergics also mimic the effects of acetylcholine. Other supplements indirectly influence the amount of acetylcholine. ALCAR helps in the synthesis of acetylcholine and centrophenoxine is thought to indirectly influence the amount of acetylcholine. Not all acetylcholine precursors work as nootropics by themselves and are often combined with positive allosteric modulators of the acetylcholine receptors like the racetams. Acetylcholinsterase inhibitors are very common in nootropic formulated blends. This is because they are very potent and require a very small dosage. Acetylcholinesterase inhibitors indirectly influence the amount of acetylcholine by eliminating an enzyme known as acetylcholinesterase. The acetylcholinesterase enzyme breaks down acetylcholine but is necessary in the body. Without acetylcholinesterase the body couldn’t survive and would go into convulsions. Some acetylcholinesterase is needed in the body to terminate muscle movement however too much can cause negative effects on cognition. This is where reversible acetylcholinesterase Inhibitors come in. Reversible acetylcholinesterase inhibitors can work very well at increasing acetylcholine in the cholinergic system. Ampakines unlike the racetams, get their own category. This is because amakines are known to work on a primary system. Ampakines do not affect the cholinergic system and instead influence the glutamatergic system. Glutamate is a neurotransmitter also very important in cognitive functioning. The two main types of glutamate receptors are the AMPA and NDMA. It is thought that ampakines work as positive allosteric modulators at the glutamate receptors. The amplification at the receptors is thought to influence learning and memory. This is the main method of action of this type of nootropic. One concern with ampakines is excitotoxicity. Excitotoxcity is a concern and is created by excess glutamate stimulation at the receptor which causes a build-up of oxidative stress. Lots of substances are considered to be excitotoxic including alcohol and amphetamines. It is thought that newer ampakines like sunifiram have very little excitotoxicity however this is a field that needs more study and should be of concern to nootropic users. Dopaminergics are the third type of nootropic substance. A dopaminergic is any drug or supplement that somehow interacts with the dopamine system. Dopamine is another neurotransmitter highly prevalent in cognitive functioning. It plays a huge role in memory formation, mood and focus/attention. Many dopaminergic drugs and supplements influence cognitive function but not all can be considered nootropic due to their dangerous side effects and safety profiles. Amphetamines for instance (Adderall, Ritalin), are dopamine reuptake inhibitors (DRI’s). These types of drugs can greatly enhance learning, memory and focus however they are highly addictive and unsafe. Other dopaminergics include MAO b selective inhibitors (Selegiline). These types of dopaminergics are considered safer than DRI’s and can also help contribute to learning and memory. Even MAO b inhibiting drugs have complications and should still not be considered nootropic due to their side effects and safety.